Sorry readers… no recipe here. I really should have taken measurements and gotten out my pen and paper. 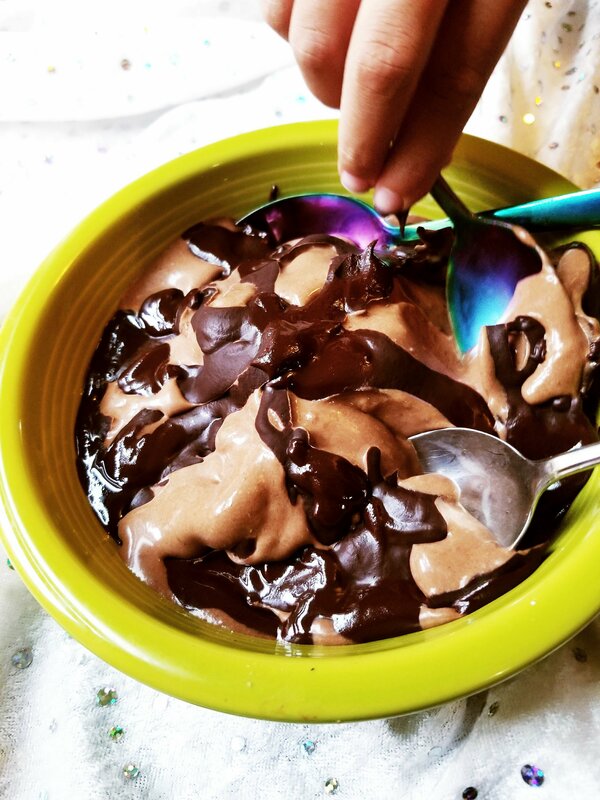 I still, however, would like to share the details on how I created this scrumptious and healthy-ish bowl of paleo and vegan double chocolate nice-cream! As you can see in the photo below there are three spoons in that little Fiesta bowl fighting for a bite of this frozen treat! I was a little short on ingredients so I worked with what I had and ended up with one lone bowl. Oh well, better than nothing right? If you love chocolate then you are in for a real treat. Continue reading to find out how you can make your own healthy ice-cream at home with a few simple (and affordable) ingredients! If you are an addict to chocolate it is time to listen up here! There is this thing, a superfood, called cacao. Not cocoa, but cacao, and there is a difference in the way that the two are processed. Raw cacao is achieved by a cold-press method with the beans. Cacao is chocolate in its purest and most natural state. Cacao is filled with enzymes that are beneficial to your body and those enzymes are lost in cocoa. I did a post recently about cacao and you can read all about it HERE. Now let’s get onto this delectable and divine bowl of chocolatey goodness! For my nice-creams I usually make sure I have two frozen bananas ready to go in the food processor. In this case, I only had a little bit more than 1 banana sliced up. Doh! I placed the frozen banana slices in the food processor along with the coconut fat from a chilled can of coconut milk. I then added in a heaping pile of cacao powder. You can score a 1 lb bag of some awesome cacao powder on Amazon by a brand named LivFit. Snag a bag of some cacao powder on Amazon! Once those ingredients are in my Cuisinart food processor I hit that powerful high button and blend and process all of the ingredients until all of the frozen banana is smooth as silk. Creamy and dreamy is what I am after! If you have a really great food processor this should be easy and quick to do. If you have a not-so-great food processor, like myself, you will have to take some time to blend it all up. I often have to turn it off and scrape the bottom and sides of the bowl with a soft spatula. For the topping, I made a chocolate shell on the stove in a little pan. I warmed up some coconut oil with the cacao powder and I also added in some raw honey to sweeten it. The raw cacao is void of any sugar content so if you want sweetness honey or some pure maple syrup will do the trick. Once that gets melted down I allow it to cool a bit. Then I drizzle it on all over the nice-cream that I just whipped up. The chocolate will harden and become a shell. Gosh, I just love chocolate shell! And this seems healthy enough for me and is paleo compliant! I love getting my spoon in there, cracking that shell up, and devouring it. This is the kind of dessert that I really wish I would have had enough of for my little family of 3. I feel good about serving this to my daughter as well. The amount of sugar in here is derived from the raw honey and I probably added only about a tablespoon in there so I have no concerns about the sugar content. Bananas have natural sugars but I don’t worry too much about that either. A typical banana has 14g of sugar and this bowl was shared three ways. Any of my posts about nice-cream inspiring you to try this simple and easy tasty treat at home? Here is a previous pretty in pink bowl that I created earlier this week. That one was the most unique nice-cream that I have come up with thus far. The color alone was just pure eye candy! Check it out in the photo below. I think this one took home the trophy for being the best nice-cream! When I first started blogging I did a post about nice-cream HERE. That post also includes the steps to DIY it at home. It is a versatile dessert that has endless possibilities. I suggest reading that post so you can get started on making this treat at home. Do you think you will give this nice-cream a try? Leave me a comment and let me know! This entry was posted in My Cooking Journey and tagged banana, cacao, cacao powder, chocolate, coconut oil, dessert, frozen treat, fruit, healthy, nice cream, paleo, paleo dessert, sweet tooth, vegan. Bookmark the permalink.